Oh hey! Look at this! It’s me and Tokyo all up in your grill! I know, I know, I’ve been absent. 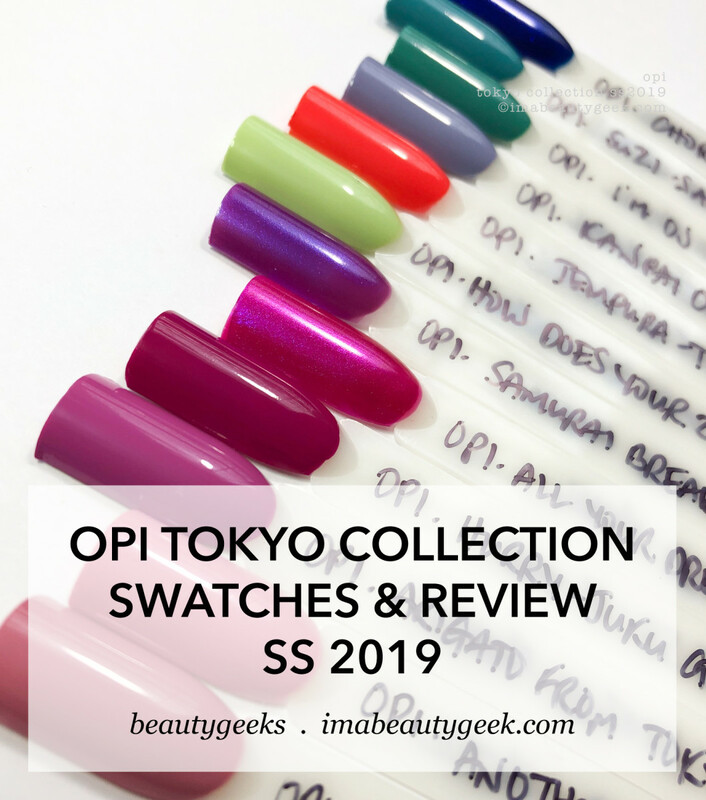 But now I’m not and I can’t really think of anything better to return with than this OPI Tokyo Collection for Spring/Summer 2019. If you’re here in Canada, it’s a solid 12 shades. If you’re in the US, you get another bunch of limited editions that I’m not going to show you because I simply don’t have ‘em. But wanna see what did land on this side of the border? Yes, I know you do! Update Feb 17: our friend Caroline sent us her swatches of the 6 exclusive shades! She swatched &apos;em and wrote stuff and we added it in! Wheeee!!!!! 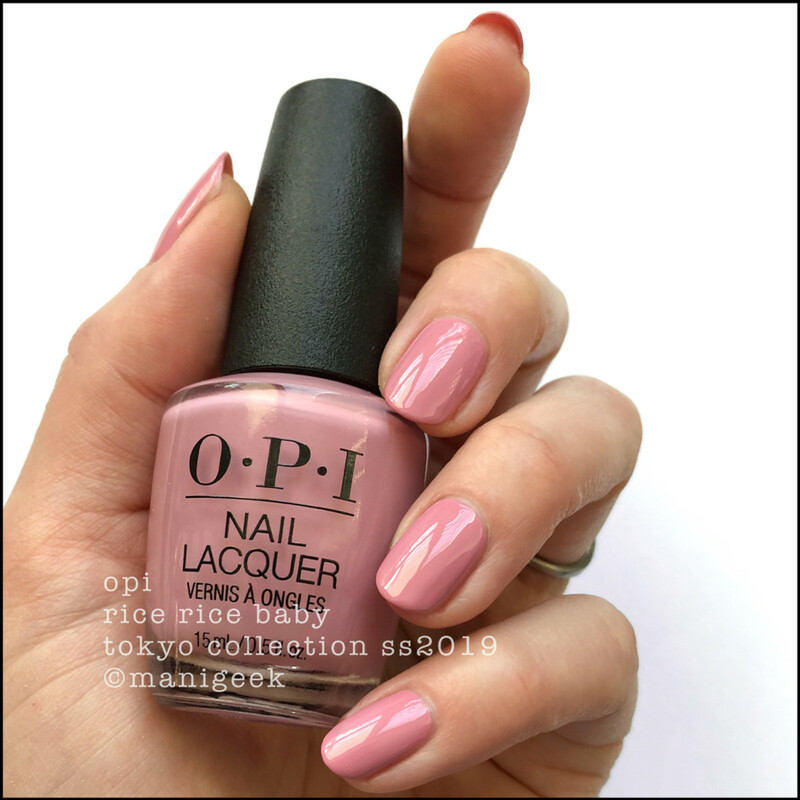 OPI Rice Rice Baby – OPI Tokyo Collection 2019 (above). That’s 2 coats (with the second being zero-pressure on account of the drag marks) and no top coat. I don’t know about you, but when I look at this, I just want it. I don’t see anything rice-like, but then again, it’s hard to see anything with these #HeartEyes in the way. 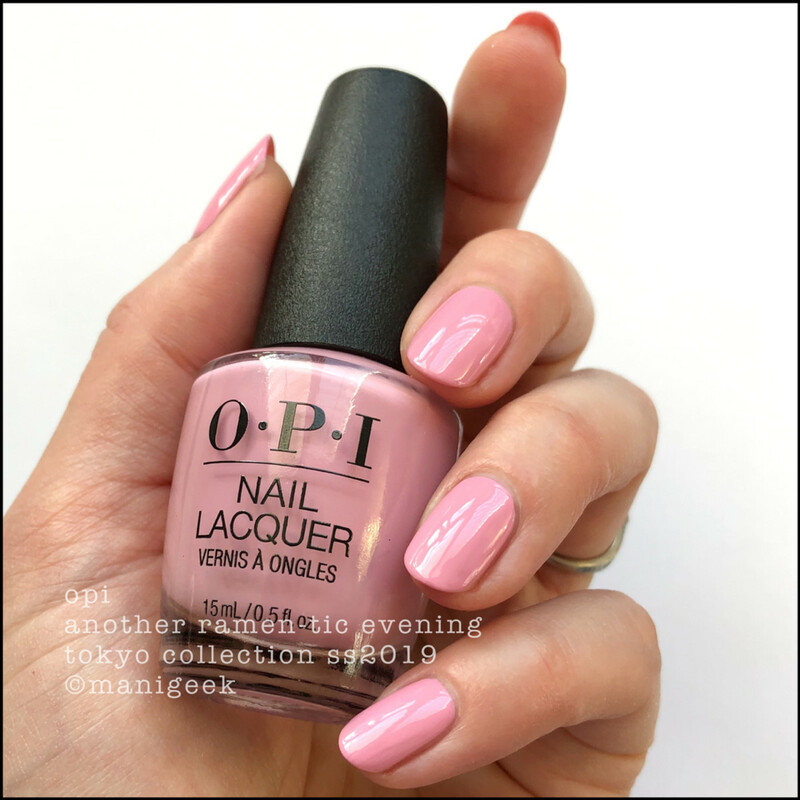 OPI Another Ramen-tic Evening – OPI Tokyo Collection 2019 (above). Another 2-coat dealie. According to my notes (and this Manigeek IGTV link) it’s a “crap brush & needs a light hand.” What does that mean? It means a couple of the brush bristles warped and the brush edge was slightly uneven. When that happens, I end up with drag. To counteract, I just float fat coats. I get less control over the blob, but as you can see, it’s still perfectly paintable. 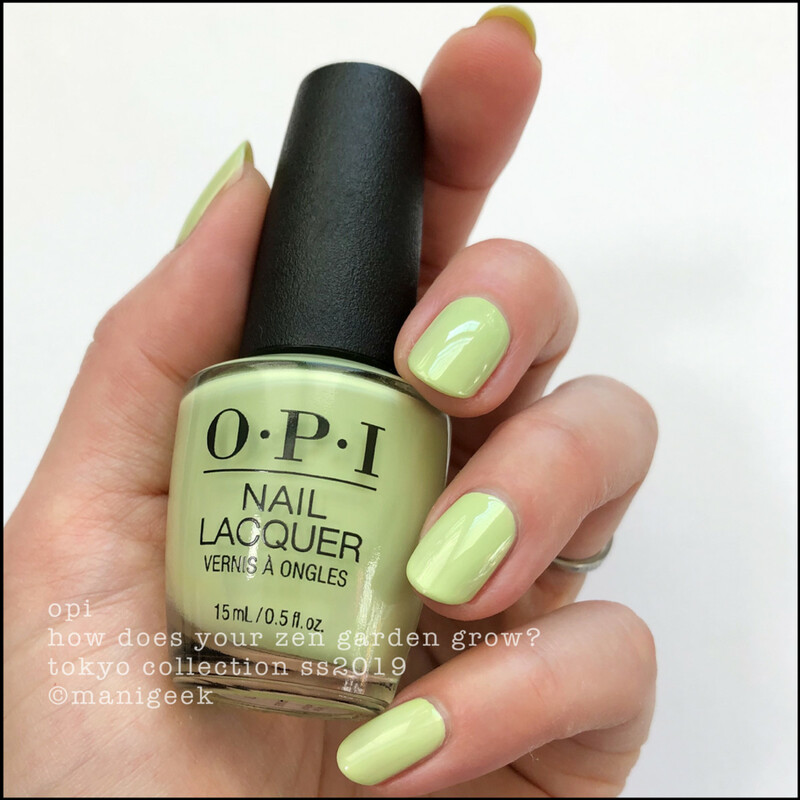 OPI Arigato From Tokyo – OPI Tokyo Collection 2019 (above). She’s another 2 coater that had to be floated. She’s also wickedly tricky to get colour accurate, but after a whole bunch of waiting for the clouds to sneak past, I’m pretty sure I nailed it! 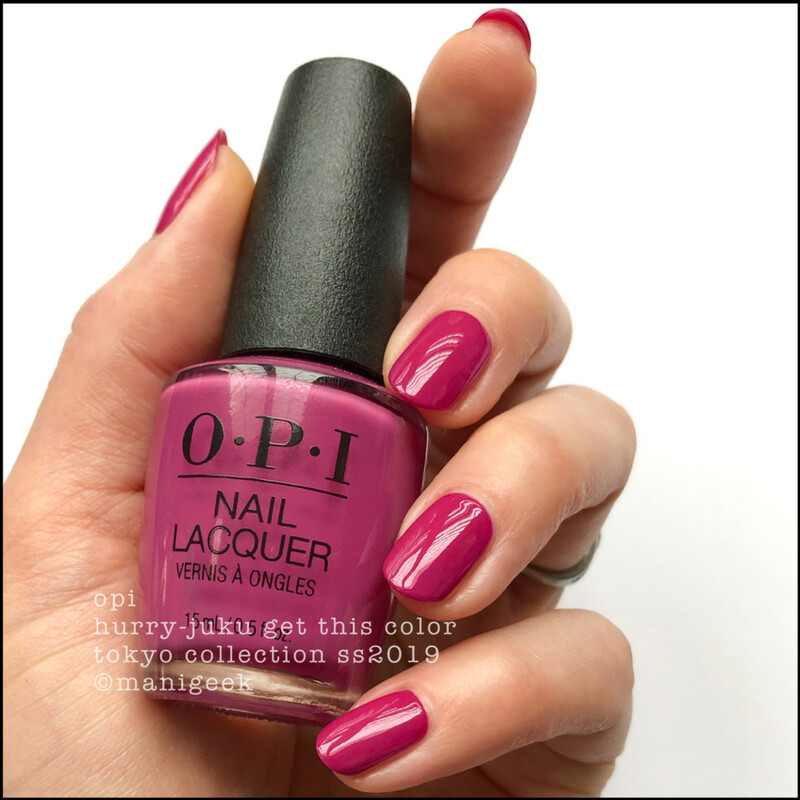 OPI Hurry-juku Get This Color – OPI Tokyo Collection 2019 (above). I know, right? How smashing! That’s a couple of quick coats and if you’ve got a keen eyeball, you can see it dries down considerably less dusty lookin’ than it does in the bottle. I don’t care though, because once dry, it still has hugely saturated dusty berry-ness and big smiles. OPI All Your Dreams in Vending Machines – OPI Tokyo Collection 2019 (above). Wheeee!! I’m a flooding machine! This thing is a little on the thin side, so don&apos;t overload your brush. And here, let me tell you a story! I said, “NoNoNo, I was really talking to the polish that time”. OPI Samurai Breaks a Nail – OPI Tokyo Collection 2019 (above). It’s good, right? 2 coats and no top. Looking at it now though, I maybe should have used top. 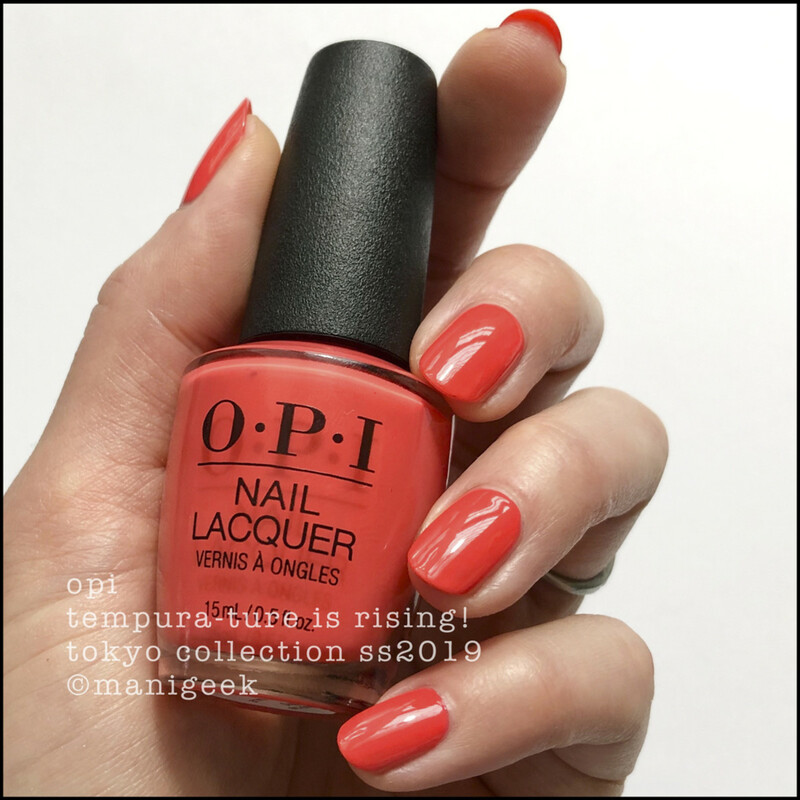 OPI Tempura-ture is Rising – OPI Tokyo Collection 2019 (above). Some of these names are just… yeah. But whatever! 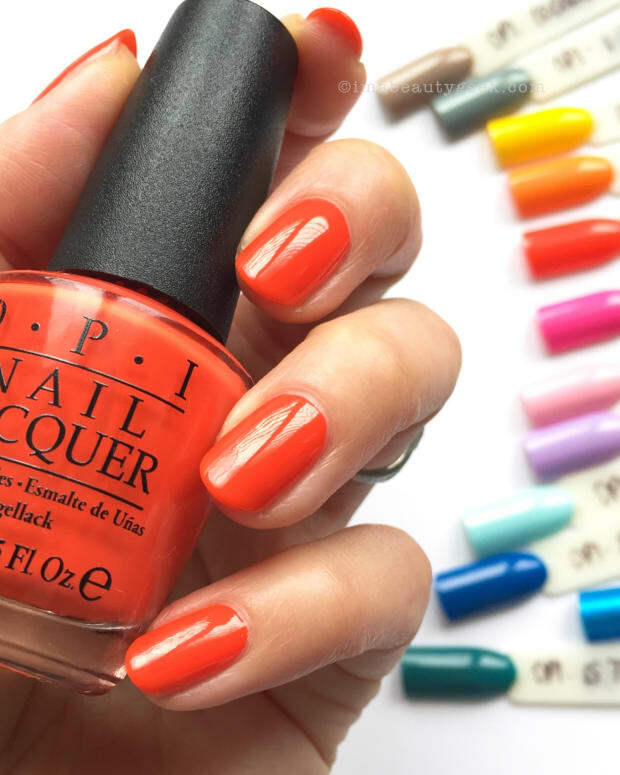 This muted poppy orange ain’t a new shade for OPI but it sure is a good one. The formula, while a little on the thin side, is totally workable. But hey, if you cap, do it only on the 1st coat okay? Why? Well that’s because the formula is so thin that if you cap last, you’ll get pooling at the tip. How do I know? Uh, been there, done that. 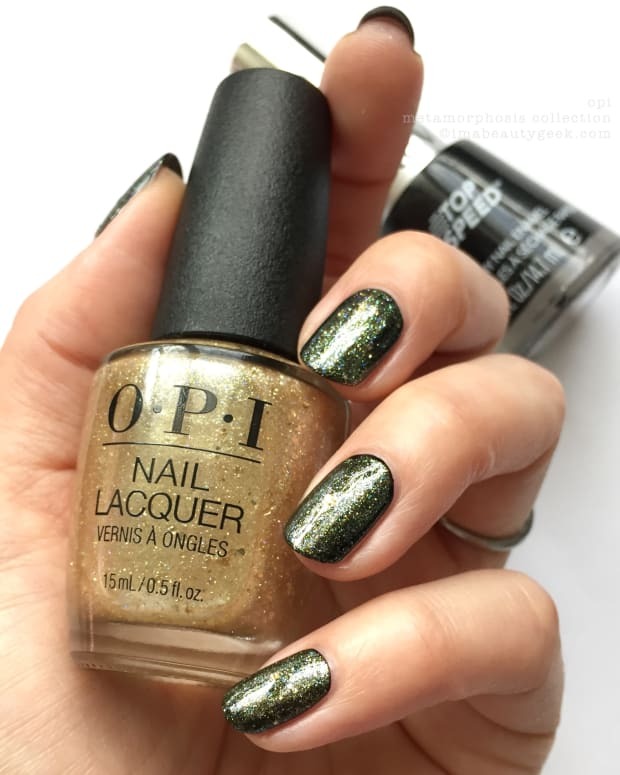 OPI How Does Your Zen Garden Grow? 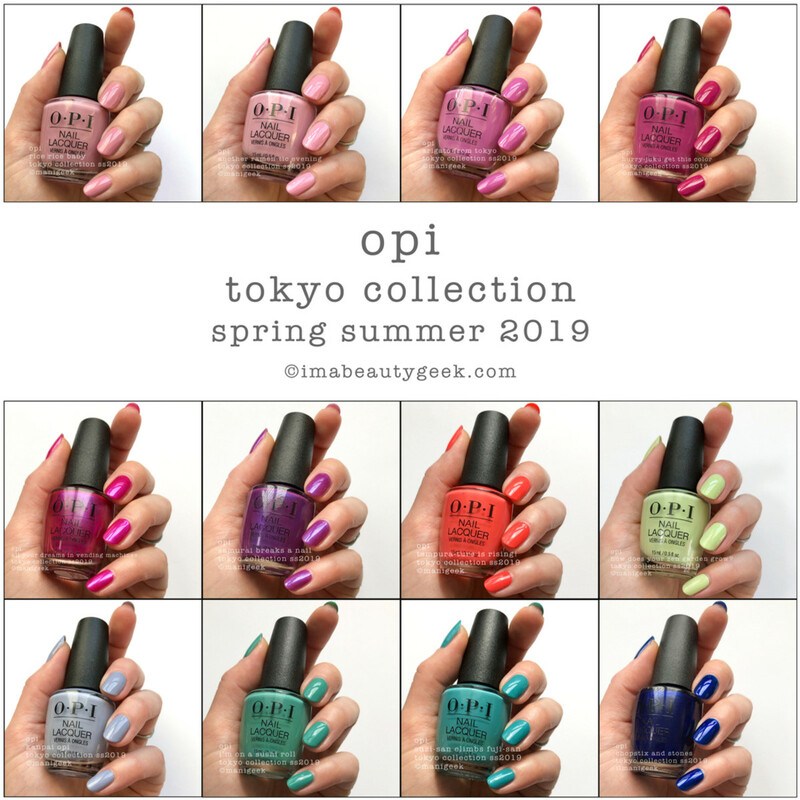 – OPI Tokyo Collection 2019 (above). 2 coats! The formula is a tiny bit runny but if you don’t overload your brush AND if you keep total control of your blob, you’ll win! I did! See? 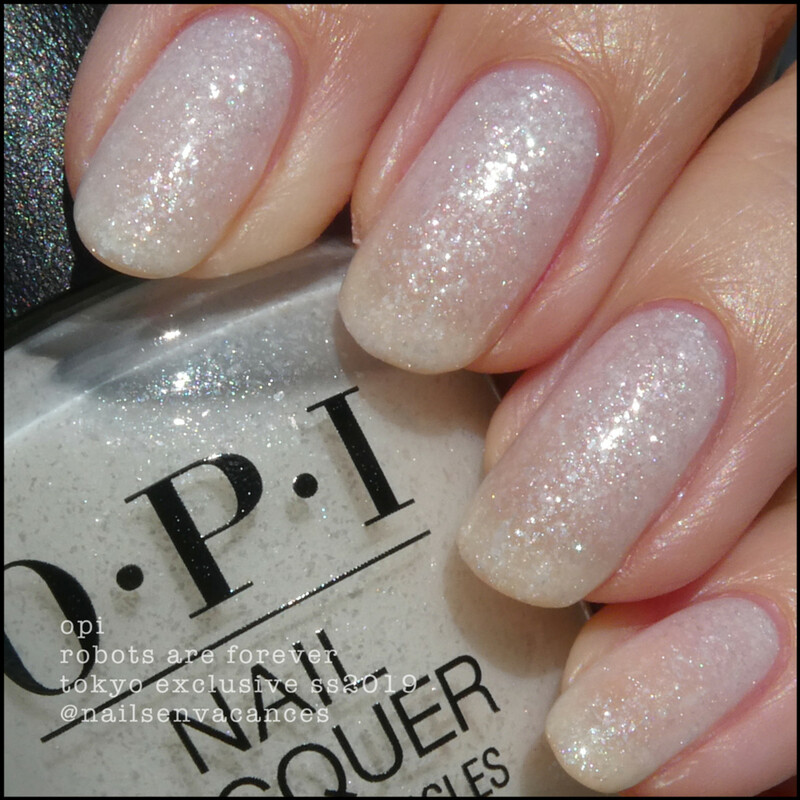 OPI Kanpai OPI – Tokyo Collection 2019 (above). You’re going to see a lot of swatches of this and not a single one is going to look the same. This thing was insanely hard to shoot colour correct, but if you’ve got an iDevice and it’s set on medium brightness, you’ll see exactly the colour I saw. I made sure of it. It’s a pale dove blue-grey and it’s dusty. And shiny. And perfect. That’s 2 coats and I had wangles in my brush that I had to snip off, but whatevz – it’s still a really, really beautiful shade of sky. 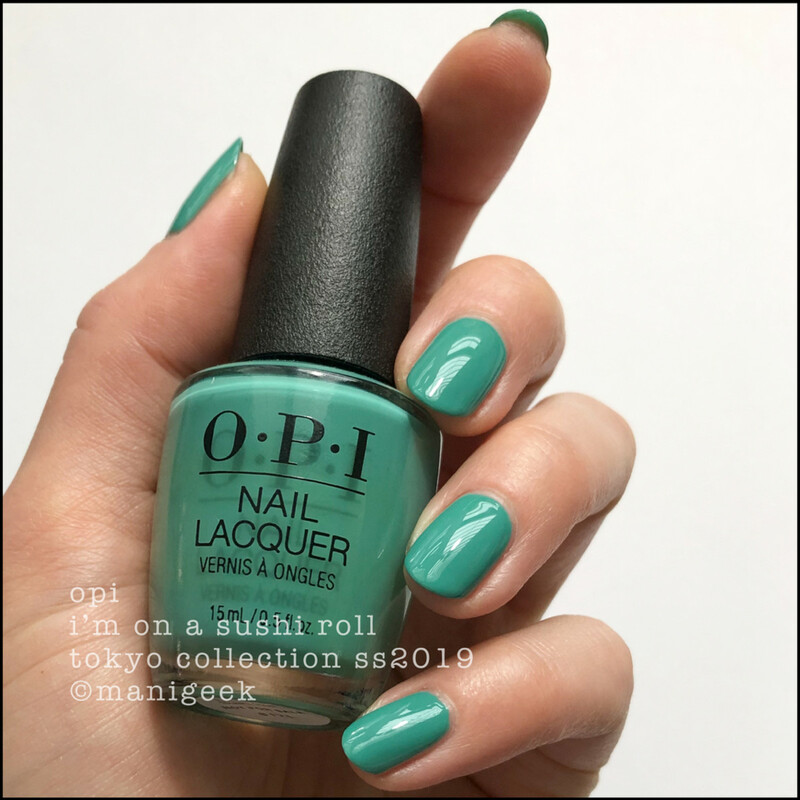 OPI I’m On A Sushi Roll – Tokyo Collection 2019 (above). Yes, I actually cringed at the name. The colour though? It’s good if you’re a fan of the green things. And the formula? 2 coats of buttery crème with a brush I had to trim wangles from – again. 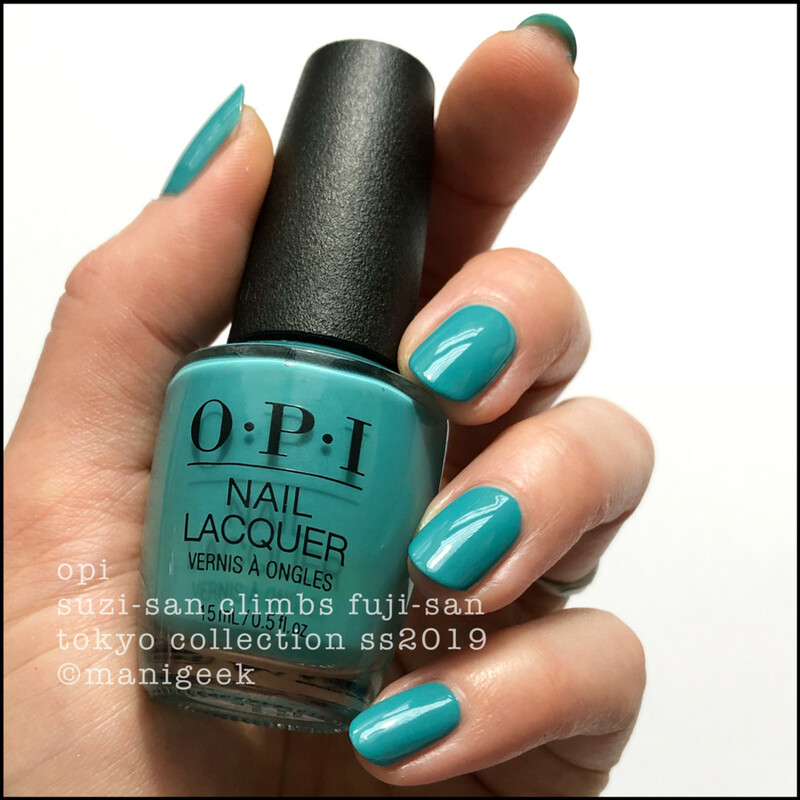 OPI Suzi-san Climbs Fuji-san – Tokyo Collection 2019 (above). My notes? Sure! “Need light, light touch with these imperfect brushes. Formula thinner than above and will flood if you overload.” It’s a hella colour for spring though. I’m totally diggin’ it. And with that above image of my amazing nail art (and possibly the wrong bottles in my hand), my work is done! I will say I’m sad I didn’t get any of the limited edition shades that are listed here in my press sheet. I really wanted to play with “R U Happy 2 C Me? LOL!”. It looks like a shade that would head directly to the file marked #ArchiveAtrocities. Sadly, I don’t get to see whether it’s really as hideous as I think it is. I know you’re sad about that too and what did I do to solve the problem? I got my friend Caroline (@nailsenvacances - if you&apos;re not following her, we can&apos;t be friends anymore) to send me her IG photos so we could all seeeee!! Here, let&apos;s look and read what she says! 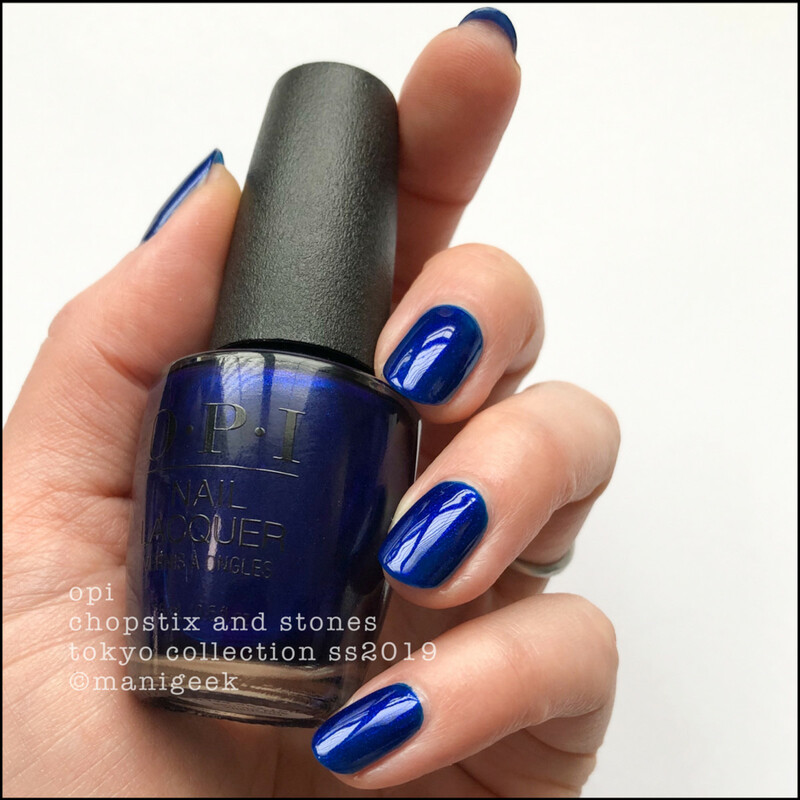 OPI Just Karate Kidding You - OPI Tokyo Exclusive (above). Caroline says this is 3 coats and it dries kind of satin matte so she added top. She also says "So pink, so happy, so pretty!" She doesn&apos;t care that it isn&apos;t opaque, she loves it anyhow and even stuck a  emoji in there. 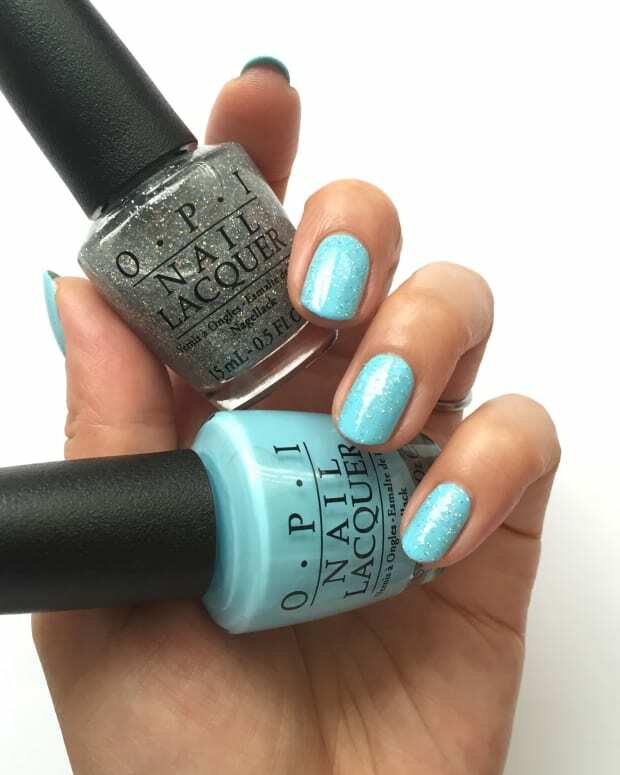 OPI Robots are Forever - OPI Tokyo Exclusive (above). What does Caroline say about this one? Well I can tell you! "3 coats + top (dries satin matte). Beauty! So ethereal. If Disney princesses wore nail polish, it&apos;d be this one". OPI Left My Yens In Ginza - OPI Tokyo Exclusive (above). This is 3 coats + top and Caroline said she was too lazy to do 4. She said it sparkled enough that she didn&apos;t find a 4th to be necessary. Me? I&apos;da tried it over black! OPI Judo&apos;nt Say? - OPI Tokyo Exclusive (above). "3 coats + top. Another beautiful and super sparkly pink that&apos;s so perfect for Spring. I wonder how it would look as a topper..." Ha! That&apos;s so funny! Caroline and I have exactly the same topper thoughts! OPI R U Happy 2 C Me? LOL! - OPI Tokyo Exclusive (above). Interestingly, on my press sheet, this shade is pictured as the one below. However, in-store and on bottle labels, it&apos;s this one. There is no doubt in my mind that there was a label snafu somewhere along the way. The press sheet also says "Smile with this golden glitter shade" and this is pink. And what does dearest Caroline have to say about it? She says "this polish is so doomed! Pearl light pink base with a bunch of tiny gold screw-looking glitters. It&apos;ll be hated by most but loved by a few. I&apos;m one of the few. I adore it. And yes, in my opinion, the whole thing does look like some kind of blooming tree or flower. Soooo pretty! ". 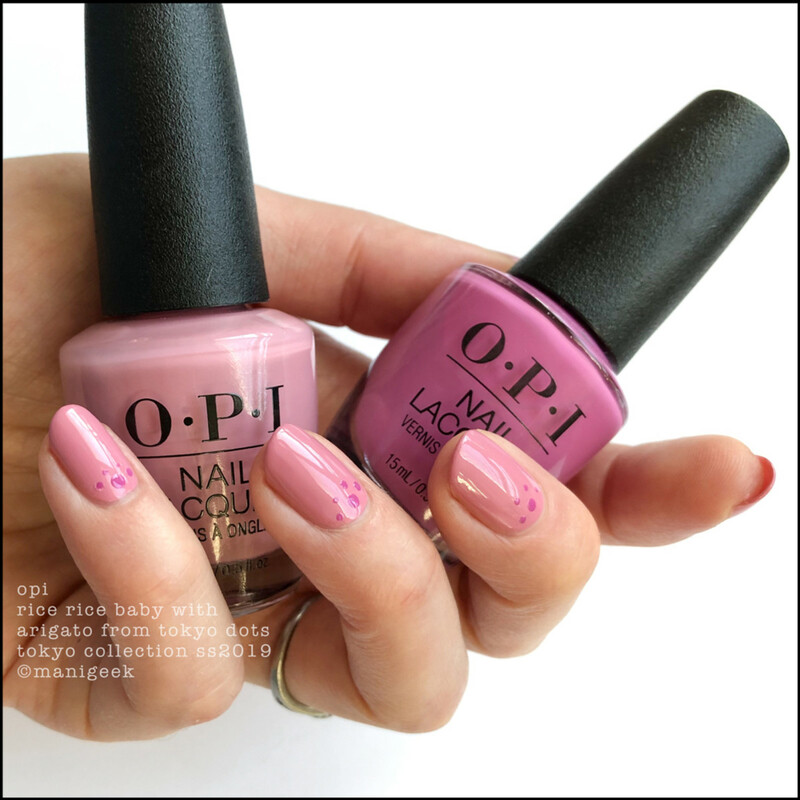 OPI This Shade is Blossom - OPI Tokyo Exclusive (above). What does the press sheet say? It says "OPI blooms a shade of cherry pink to spring into Spring." See? They totally mixed up the labels. Dumbheads. And Carolines blob on this one goes like this "3 coats + top. This should be the hero shade for a collaboration collection with Home Depot. The glitters look like the tiniest screws ever made. So weird!" Her application notes are kind of fun too! "First I did 2 coats + top and despised it with all my heart. Then I tried 3 coats and I loved it! I know it&apos;s not everyone&apos;s cup of tea but I really did enjoy it. With 3 coats. Not 2". I dunno - I think I&apos;d try it just so I could see what those glitters looked like. Then I&apos;d file it. You know... under A. Thank you, Caroline (@nailsenvacances) for letting us use your photos and your words so everyone can see the shades I didn&apos;t get! You&apos;re the best! Now we can talk about Tokyo! Yes, it’s been available for a couple of months but still, let’s talk! I want to know if you and I are on the same page in terms of the colour palette, the complimentary-ness of it all, and the “hmmm… I think I’ve seen that before-ness” of it, too. Wow, I’m just making up words all over the place, huh? I clearly need a nap!